The Adventures of Pinocchio, hard cover with dust jacket and foil stamping. A brand new reprint from Greg Hildebrandt's original 1986 edition that was originally published by Unicorn Publishing. This is the new 2003 unsigned edition published by Running Press. 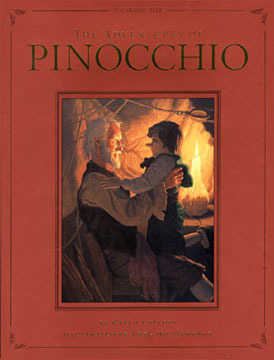 Story by Carlo Collodi with Illustrations by Greg Hildebrandt. Includes 18 color and 6 black and white illustrations. Also available signed by Greg Hildebrandt for 15 dollars. Item #104675.